When do you think you should stop taking antibiotics once you have begun a course of treatment? 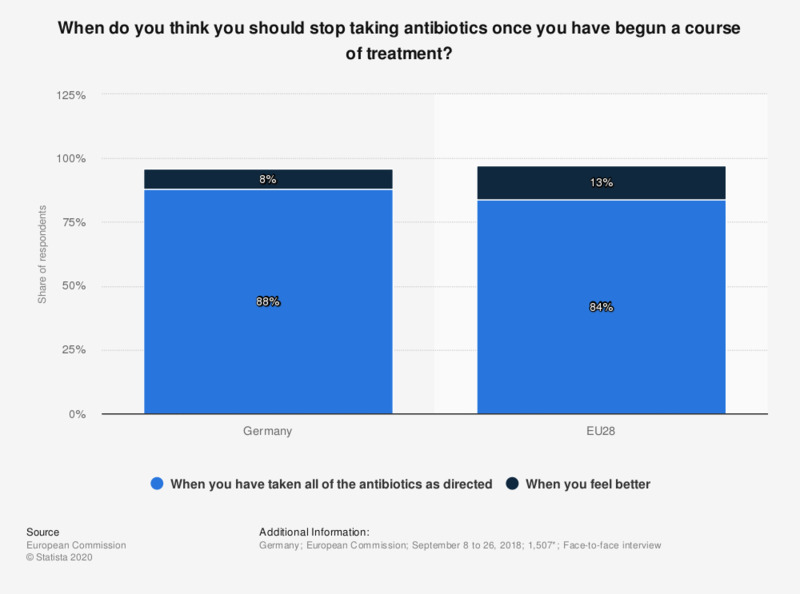 This statistic displays the response of individuals when asked 'when do you think you should stop taking antibiotics once you have begun a course of treatment' in Germany, in 2018. Antibiotics are medications that can kill or hinder the growth of bacteria which cause infections in people and animals. In 2018, 88 percent of respondents in Germany believed that you should take all of the antibiotics as directed, this was above the European Union average at 84 percent. 8 percent of respondents in Germany believed that you should stop taking the antibiotics when you feel better. Statistics on "Antibiotic use in the United Kingdom (UK)"
Which of the following sources of information would you use in order to get trustworthy information on antibiotics? When was the last time you were prescribed any type of medicine on the NHS, if ever? When you are prescribed medication, how often do you read the instructions, if ever? Thinking about prescription medication, which of the following actions, if any, have you taken in the past? Who or what is to blame for the misuse of antibiotics in livestock? Were you aware of concerns over the use of antibiotics on livestock before today? Have you taken any antibiotics orally such as tablets, powder or syrup in the last 12 months? How did you obtain the last course of antibiotics that you used? In the last 12 months, do you remember getting any information about not taking antibiotics unnecessarily, for example for a cold or a flu? How did you first get this information about not taking any antibiotics unnecessarily? On which topics, if any, would you like to receive more information?